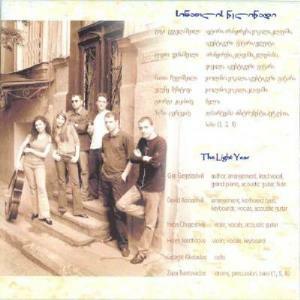 SINATLIS TSELITSADI (aka THE LIGHT YEAR) were formed in 2004 in Tbilisi, Georgia. Their music is daring and furious blend of classical music, various aspects of progressive rock, Georgian folk and much more. 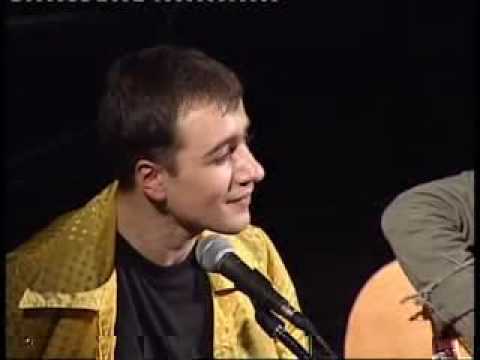 They released their debut "Sky Way" in 2004 (it's a live recording) with the following line-up: Gigi Gegelashvili (author, arrangement, vocals, grand piano, acoustic guitar, flute), David Keinashvili (arrangement, keyboards, keyboard bass, vocals) Helen Mechitova (violin, vocals) Natia Chugoshvili (violin, vocals), Giorgi Kikabidze (cello), Zaza Tsertsvadze (drums, percussion). They released their second album, "Python's Dream" in 2007. David Changoshvili replaced Tsertsvadze on drums, Gvantsa Matiashvili replaced Kikabidze on cello (while doing some vocals as well), Koba Manjgaladze joined a band with electric guitar and George Iobashvili on bass. 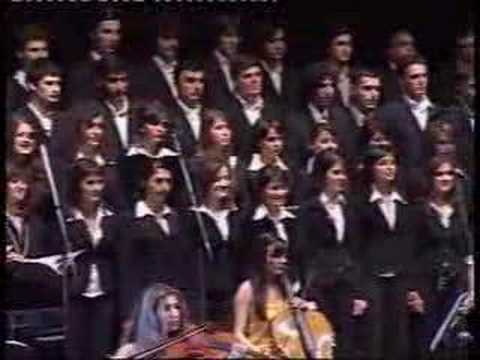 Their project of rock-cantata (with symphonic orchestra and 150 musicians in choir), named "Generation XXI" was the first of the kind in the history of Georgia. The band's sense for spectacular plus it's unique blend of musical styles is a must for every progressive rock fan. The current line-up: Alexander Ananov replaced Iobashvili on bass while Tamuna Shekiladze and Archil Davitashvili added to the band's sonic palette, on keyboards and trumpet respectively. From "prog rock little place"
I was simply fascinated when I came to listen to this band (their original name shold be pronounced Sinatlis Tselitsadi) from Georgia (the European Georgia, not the USA State) and especially to their debut album called " Gza Tsisken " (pronounced Gza Tsisken and meaning "Sky Way"). At that time of their career those musicians were far into Symphonic rock and I reckon the entire album is worth your attention, so I put its Prologue here, as it announces all their best features. You'll surely appreciate a captivating recurring riff, some spacey keyboards, a syncopated bridge a la Kate Bush and a heartbreaking string section formed by two violins and one cello. The changes are all well found and even better done, and this opening track creates an electric expectation mood, surely the best viaticum for the following songs. I really like this intro and the whole album... too bad the band decided to get into some major sound changes in recent years! Well, artist must choose freely their own way... I certainly will listen to their future works. In a portion of the world where there is much turmoil and uncertainty comes a melodic beacon of hope and light. This band is known as The Light Year. Coming out of the area between the Black Sea and Caspian Sea in the country of Georgia, it is certain that no matter how much turmoil, progressive rock has tentacles in Georgia. 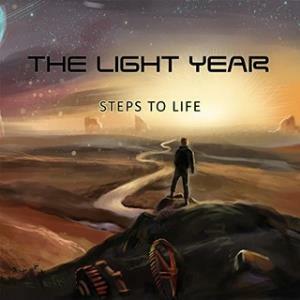 The Light Year Steps Of Life is one of those progressive masterpieces that come from out of nowhere once every 5 to 10 years. The Light Year are a band at the crossroads of Enchant and Transatlantic meets Pain of Salvation and Porcupine Tree. 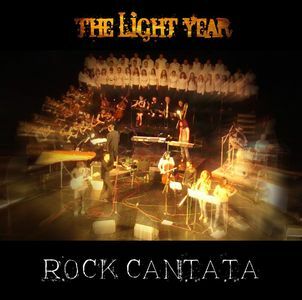 The Light Year combine very modern neo progressive elements with vintage hard rock/heavy metal with a twist of vintage progressive rock elements. The Light Year combine Arabic, Oriental and near Eastern influences with Western power progressive rock/metal elements. Steps of Life begins with a powerful progressive symphonic instrumental track called Tornado 1 which starts off like the opening of a cinematic production. Tornado 1 has various hooks and instrumental melody. It reminds me a little of Liquid Tension Experiment at times. Tornado 1 charges right ahead in a progressive frenzy setting up track 2 Steps to Life. Steps of Life starts off as a well articulate Acapella voice composition. At about the 1:16 mark the keyboard comes in with another layer to add to the vocal melody. At the 2:35 mark the track gains a acoustic guitar layer to be joined by the rhythmic section at the 3:35 mark. At about the 4:30 mark the track takes on a Peter Gabriel rhythmic vibe building the track to a up tempo track at this point. About the 5:35 mark it takes on a Spock's Beard sounding track. At the 7:15 mark the track takes on a neo progressive vibe much like the band Enchant. Tornado 2 starts off with a thunderous rhythmic section. The keyboards are executed quite well as a percussive rhythmic instrument instead of the status quo stringed sectional style instrumental. Tornado 2 like Tornado 1 is a instrumental in a cinematic style. The album starts taking on a conceptual sound at this time. Tornado 2 has some seriously heavy fusion elements going on with the composition all the through much like Planet X or Gordion Knot At 4:55 mark there appears a choir as more of a chant instrument even more so than a vocal. Steps Reprise is a very well arranged and well placed track to bridge into the next track Side. Side opens a lot like Yes with lush vocal layers engineered with a well rounded rhythmic section and the keyboard and acoustic guitar giving the track absolution. At the 2:35 mark the track really takes a very up tempo melody to harmony exchange. Side goes in and out from up tempo one moment to a down tempo the next moment. Side has that later Pink Floyd sound of the 1980's. This track has some light alternative elements to it as well. Dark Times starts out with a serious down tuned alternative sound. The vocal takes on a abstract atmosphere through a minimalist filter. Dark Times displays a less in more attitude and with various time signatures and breaks. With every break pause the track adds or subtracts various layers. Towards the end the track is blistering with some very heavy progressions and time signatures. Damskerland is a mellow acoustic track. Although the vocals are being sung here they also sound a little in the realm of spoken word making it easy for the listener to grasp the story of Damskerland. This has almost a Dust In The Wind style about it. Love Without Love begins with a sitar oriental sound to start off with this mini epic. About the 2:32 mark the track takes on a mellow guitar atmosphere. The warmth of the vocals appear to be filtered through the keyboard although they are not. Love Without Love reminds me of a little longer Kayleigh or Easter from Marillion. It has a great flute at the 6:45 mark and rain stick sound giving it a really heavy near to far Eastern sound. At the 8:44 mark the track takes a symphonic approach almost like a movie soundtrack. This is perhaps the most eclectic track on the album. Digital Dream opens subtly with a fade in drum percussion passage. Soon they electric guitar and keyboards take on a very heavy jazz prog fusion vibe. This track is like Buddy Guy and Miles Davis and Steely Dan rolled in one. The track soon breaks instrumentally and a spoken word section appears right before the free form prog jazz fusion takes off again. At the 4:30 mark the track takes on a vibe progression like Pain Of Salvation with the vocal arrangement. My Lord picks up right where Digital Dream left off however, with a more distorted progression. The vocals sound heavily like John Wetton in King Crimson. The band even ventures into areas of funk with their progressions. At times it sounds like the instruments are talking back and forth from one another. There is a lot of twists and turns you do not know where the band is going with the track. About the 5:00 mark this track drops off some for a refined piano and keyboard atmosphere. Soon after sounds of nature like the birds in a forest chirping give the track depth and emotion. The character in this story starts to quietly question life on a lyrical level. About the 8:00 mark there is some heavy psychedelic elements instrumentally supporting the lyrical narrative. The track ends with a nice fluid cinematic ending. Sky Way starts with a beautiful lush piano intro as if the instrument is isolated. Soon a partial spoken word partially sung vocal comes in. Soon after a calm guitar and languid rhythm section kicks in and the track takes almost a ballad style. This is a track of personal reflection lyrically. Sky Way has potential for the listener audience to sing this back to the band in a live setting. Tornado 3 is a overall reflection of the album. Little portions of every track before it appear within the span of a 1:15. This is a heavy 1:15 as well. The Light Year have made a statement on Steps of Life. This band mixes a little bit of the old with the new to form there own unique sound. The even bridge Eastern and Western musical styles into a well craft progressive music brew. My generation of Georgians should remember the stereotypes about Georgian rock music that circulated in their childhood. They should remember how would we build in each other's heads that rock music wasn't Georgian man's business and would blame it on the absence of some abstract "spirit". They should remember that majority of us, the "rock music lovers", never had even one tape of any Georgian music (with the exception of one table-song compilation maybe, just to make parodies and "elucidate the difference"). Et cetera, so forth and then some. 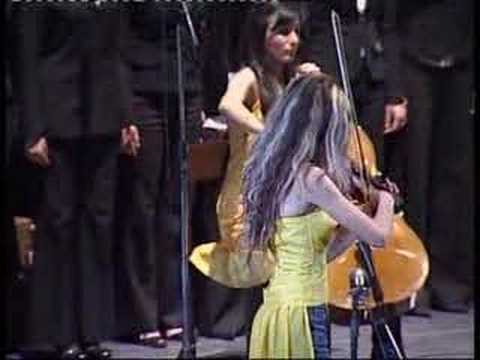 Hence in my childhood, my interest in Georgian music was mostly limited to music videos I commonly saw on TV. And the musical west seemed like a fairy-tale unrelated whatsoever with Georgian reality. So, with this status quo affirmed, I used to collect the music of King Crimson, Yes, Van Der Graaf Generator - I thought Can were English at that time, for I used to be told that only English write great rock music. So when I was 14, I saw one man talking about his band's music on Stereo One (main music TV channel at that time) and he called it art rock. I was very surprised - then they mentioned the band name "Sinatlis Tselitsadi" (Georgian for "The Light Year"). The channel showed some interesting excerpts from their concerts, so I decided to find their CD that had been just released. I managed to find this album only a couple of years later, when I got internet installed. I wouldn't say I liked it fully from the first listen, because despite music being harmonic, it's still quite complex and the sound is very non-standard, but it soon won my heart over - it just couldn't be otherwise for there's so much melodic beauty in it. Sinatlis Tselitsadi's debut release (just like the sophomore one) is a live album, but you could only tell it by applauses - sound engineering is on high level. Overall sound of music is, as I mentioned, very unusual - band completely eschews bass and electric guitars and grand piano, atmospheric keyboards and the string section determine the sound. Gigi Gegelashvili's vocals, while not having very broad range, accentuate the music by the virtue of expressiveness. As a result, Sinatlis Tselitsadi offers us extremely lyrical, "RPI-type" symphonic progressive rock, where beautiful melodies all follow one another. Even the most dramatic moments are full with contrasting lyricism, giving the impression of certain fullness. Format-wise, music varies quite much - there are dark, multi-movement songs ("Somebody Walking Along" , "Circulation Of Time In Space" , "Escape From Paradise" ), a couple of well-development instrumental themes ("Prologue" , "Circle" ), short songs used for albums thematic development ("Town We Have Built" , "Möbius Strip - Part 1" ), short, beautiful interlude ("Etude For Children And Adults" ) and two breathtaking ballads - "Sea Passion"  and "R-atom" . These two songs, located near the start and end of the album, form the most direct, loud manifesto of music's sentimental aesthetic. Instrumentally, the performance is top-class. There are no contrived virtuoso passages whatsoever - everything serves the music's need. 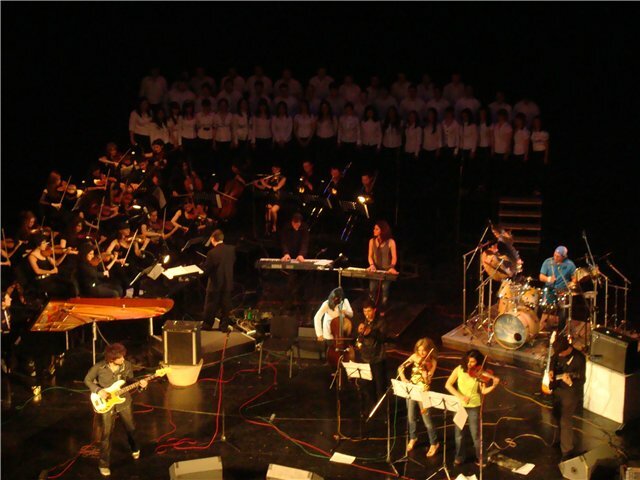 Although of the album is recorded live, musicians' high performance skills let the music flow freely between segments of different difficulties, moods and intensities. 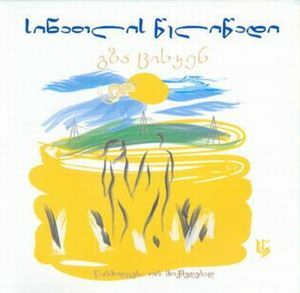 Strange: if you asked me what I thought of this album right after the first listen, I'd have just said that it's just a good work, but as it often happens with harmonically complex music, I fell in love with this music so much that it became my favourite Georgian album. So, here you have the masterpiece of highest European level - something like Italian legends, PFM, Quella Vecchia Locanda, Celeste or Le Orme did. If these names don't ring any bell, then imagine Genesis with more classical music influences. If still no success - then hear Sinatlis Tselitsadi and then the aforementioned bands. Sinatlis Tselitsadi is still active with changing personnel. In 2010, they released their sophomore live album "Generation XXI - Rock Cantata" and the next album is under way.